Thomas Slade Gorton III (born January 8, 1928) is an American politician. A Republican, he was a U.S. Senator from Washington state from 1981 to 1987, and from 1989 to 2001. He held both of the state's Senate seats in his career and was narrowly defeated for reelection twice as an incumbent: in 1986 by Brock Adams, and in 2000 by Maria Cantwell after a recount. Gorton was twice both senior Senator (1983–87, 1993–2001) and junior Senator (1981–83, 1989–93). Since Gorton's 2000 re-election loss, no other Republican from Washington has been elected as a U.S. Senator. Gorton was born in Chicago, Illinois, brother to Nathaniel M. Gorton, and served in the United States Army from 1945 until 1946. He then attended and graduated from Dartmouth College. He graduated from Columbia Law School, and served in the United States Air Force from 1953 until 1956, continuing to serve in the Air Force reserves until 1980 when he retired as a Colonel. Meanwhile, he practiced law, and entered politics in 1958, being elected to the state legislature of Washington, in which he served from 1959 until 1969, becoming one of the highest-ranking members. He was then Attorney General of Washington from 1969 until he entered the United States Senate in 1981. During his three terms as Attorney General, Gorton was recognized for taking the unusual step of appearing personally to argue the state's positions before the Supreme Court of the United States and for prevailing in those efforts. He married Sally Clark Gorton on June 28, 1958. Sally died on July 20, 2013. In 1980 he defeated longtime incumbent U.S. Senator and state legend Warren Magnuson by a 54% to 46% margin. He was defeated by former Congressman and Carter administration Transportation Secretary Brock Adams. He ran for the state's other Senate seat, which was being vacated by political ally Dan Evans, in 1988 and won, defeating liberal Congressman Mike Lowry by a narrow margin. In the Senate, Gorton had a moderate-to-conservative voting record, and was derided for what some perceived as strong hostility towards Indian tribes. His reelection strategy centered on running up high vote totals in areas outside of left-leaning King County (home to Seattle). In 1994 he repeated the process, defeating then-King County Councilman Ron Sims by 56% to 44%. He was an influential member of the Armed Services Committee as he was the only member of the committee during his tenure to have reached a senior command rank in the uniformed services (USAF). He campaigned in Oregon for Gordon Smith and his successful 1996 Senate run. In 1999, Gorton was among ten Republican Senators who voted against the charge of perjury during Clinton's impeachment, although he voted for Clinton's conviction on the charge of obstruction of justice. In 2000, Democrat Maria Cantwell turned his "it's time for a change" strategy against him and won by 2,229 votes. Furthermore, Washington's Indian tribes strongly opposed Gorton in 2000 because he consistently tried to weaken Indian sovereignty while in the Senate. Twice during his tenure in the Senate, Gorton sat at the Candy Desk. In 2005, Gorton became the Chairman of the center-right Constitutional Law PAC, a political action committee formed to help elect candidates to the Washington State Supreme Court and Court of Appeals. Gorton is an Advisory Board member for the Partnership for a Secure America, a not-for-profit organization dedicated to recreating the bipartisan center in American national security and foreign policy. Gorton currently serves as a Senior Fellow at the Bipartisan Policy Center. Gorton serves on the Board of Trustees of the National Constitution Center in Philadelphia, which is a museum dedicated to the U.S. Constitution. Gorton represented the city of Seattle in a lawsuit against Clay Bennett to prevent the relocation of the Seattle SuperSonics basketball franchise, in accordance to a contract that would keep the team in KeyArena until 2010. The city reached a settlement with Bennett, allowing him to move the team to Oklahoma City for $45 million with the possibility for another $30 million. In 2010, the National Bureau of Asian Research founded the Slade Gorton International Policy Center. The Gorton Center is a policy research center, with three focus areas: policy research, fellowship and internship programs, and the Gorton History Program (archives). In 2013 the Gorton Center was the secretariat for the ‘Commission on The Theft of American Intellectual Property’, in which Gorton was a commissioner. Gorton is also a Counselor at the National Bureau of Asian Research. In 2012, Gorton was appointed to the board of directors of Clearwire, a wireless data services provider. Gorton is a member of the board of the Discovery Institute, notable for its advocacy of intelligent design. Gorton is currently Of Counsel at K&L Gates LLP. ^ a b "Civic leader, political wife Sally Clark Gorton dies". The Seattle Times. July 22, 2013. Archived from the original on July 28, 2014. Retrieved July 17, 2014. ^ Westneat, Danny (September 14, 2008). "Where has McCain's honor gone?". The Seattle Times. Archived from the original on September 15, 2008. Retrieved September 15, 2008. ^ Kelley, Matt (April 30, 2000). 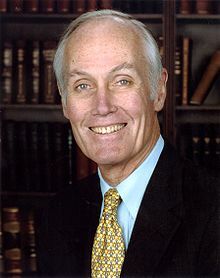 "Tribes' Top Target in 2000: Sen. Slade Gorton". Los Angeles Times. pp. B6. Retrieved September 15, 2008. ^ Hendren, John (September 10, 2000). "Tough re-election race is nothing new to Gorton". The Seattle Times. Retrieved September 15, 2008. ^ Balter, Joni (April 24, 2005). "Who is Maria Cantwell?". The Seattle Times. Retrieved September 15, 2008. ^ Getches, David H., Charles F. Wilkinson, Robert A. Williams, Jr. Cases and Materials on Federal Indian Law (2005). St. Paul: Thompson West. 5th ed. p. 29. ^  "Senior Fellows, Bipartisan policy Center"
^ "National Constitution Center, Board of Trustees". National Constitution Center Web Site. National Constitution Center. July 26, 2010. Archived from the original on July 27, 2010. Retrieved July 27, 2010. ^ "Seattle, Bennett Slam Door on the Sonics". The Wall Street Journal. July 3, 2008. ^ "Slade Gorton Policy Center Web site". Archived from the original on January 10, 2014. ^ "IP Commission Web Site". ^ "National Bureau of Asian Research Web Site". Archived from the original on August 28, 2016. Retrieved April 7, 2014. ^ "K&L Gates Firm Bio". Wikimedia Commons has media related to Slade Gorton.